A lengthy report on Apple CEO's Tim Cook current visit in China shines a light on the real reasons he is traveling that far in a busy month for launches and announcements. No, it's not the Chinese "spy chip" scandal, this one was already debunked by Apple, but rather a real possibility that President Trump's trade war with China may hurt Apple's business. We are willing to... find mutual benefit and win-win results, and to inject new vitality into Shanghai’s development. We are hoping that Apple will play a bigger role in promoting exchanges and cooperation between Shanghai and the United States. Apple's CEO, on the other hand, reportedly lavished Mr Li with praise in his turn, extolling the virtues of Shanghai's "strong support and good service to the development of the company." Another local report, however, tips that Mr Cook is trying to stave off a potential sales disaster in the world's largest cell phone market. A perfect storm of negative attitudes towards American products due to the ongoing trade and spy wars initiated by the White House and the high iPhone XS Max price in China has resulted in "disappointing" sales of Apple's new iPhones according to a dealer channels' probe. After all, the iPhone XS Max costs the equivalent of $1850 there, while at this price a Chinese customer could get two high-end Huawei handsets and spare some change for a celebratory dinner. Thus, Tim Cook's "charm offensive" at this time makes perfect sense and doesn't look like it is even remotely related to the "spy chip" stories, as he is even rumored to meet the Chinese president at some point during the trip. Ofc, do you expect them to starve their holy stakeholders? Tim Cook went to China to beg them to buy his overpriced junks, pathetic. So by saying 4 words, you say I’m mad lol. You sound dumb dude. Now you say: sounds like ur the one who’s dumb, brother bro. Apple is continuously losing market share in China. I don't see Apple bouncing back in China. Apple is almost dead in India with only 1% sales. The two largest smartphone markets in the world, and Apple is dropping like flies. Unless Apple drops the prices, then Apple doesn't have a hope in hell of recovering their market share, period. I won't be surprised if the launched another Chinese exclusive model, like 32GB iPhone XR for $699 (with dual sim slot obviously). thats all they have to do... lower that price by 150 or 200.... you wont be able to find a store with any in stock! "Chinese "spy chip" scandal, this one was already debunked by Apple" Wait until Apple ships enough iPhones then the spy chip will then be "discovered" inside. 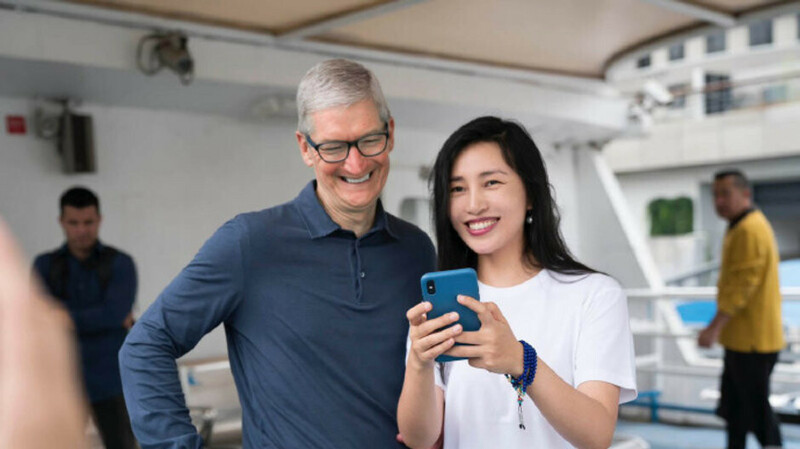 Oh now i see tim cook gone there to click selfies with chinese ladies chick lol sound like tim cook is happy clicking photos with hot chinese chick out there seen in above pics.That women in above pic is cute and sweet lady or girl for me. :)Hope he doesn't pollute there with his old stinky farts on womens and mens out there already china is a polluted country. Lots of businesses are limited by international trade constraints. Apple will just have to deal with it like the rest of us. No one is entitled to any product at any price. Could they buy 2 other Chinese-brand premium phones - yes. Do they want to - no? They have to live the same decision everyone else does. Kowtowing to a bunch of thieves? Typical American capitalist. Putting money above national pride. Apple expect high sales in a country where 90% of thr people make less than 1/2 that in a month. Haha! They aren't buying your s**t anymore, what do Timmy? Priced themselves too high and now in a corner against common sense, good luck with that.